Why walk when you can ride? Ever wonder why people sit for hours in traffic? Instead, how about letting the bus driver or train engineer or robot do the driving? Mass transit systems include bus and rail systems serving urban areas around the world. 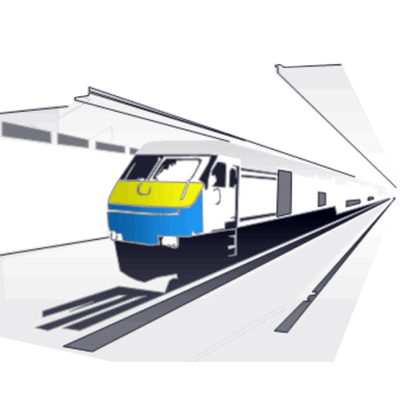 Rapid transit, otherwise known as the underground, subway, tube, elevated or metro system, is alternative public transportation. In England, such a system is called an “underground” while in North America it is a “subway.” In most of the rest of the world it is called a “metro”. The oldest rapid transit system in the world is the London Underground, which opened in 1863. Railways usually serve urban areas with a high occupancy capacity, frequent service and grade separation from other traffic. 162 cities have rapid transit systems, totaling more than 8,000 km of track and 7,000 stations. Twenty-five cities have new systems under construction. Efficient energy usage, low capital cost, low operating cost, low environmental impact, low travel time and high usability are important factors to rapid transit. Move around with mass transit! Transportation posters create identity, image and function for modern communities. Transportation charts assist visitors and residents in finding their way around a city. Charts come in many sizes: some fold up and fit in your pocket! A sign grabs attention and presents all of the transportation routes of trains, buses and even bikes. Do you have mass transit in your city? If so, collect the maps that communicate the routes. Next, research mass transit charts from around the world. What do the posters have in common? How are they different? Do you think they encourage ridership? What could you do to increase public interest in taking mass transit? Be a mass transit media collector! 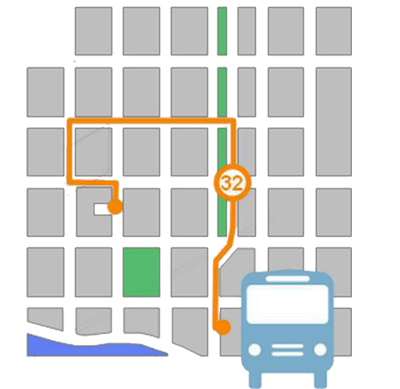 In this activity, you and friend (or your entire class) will choose a route to take on a bus, train or water taxi. Taking a digital camera; document what you see as you approach the station or stop. Are there signs? Is there a clear place to purchase tickets? Are there places to sit and wait? Can you get a newspaper or refreshments for your trip? Is it pleasant? Once on board, observe what people do. Do they sit alone? In pairs? With friends? Are they reading, listening to music, talking? What sounds do you hear? Is it a quiet ride or a ride full of screeching, buzzing and squeaking? Make a list of all of the activities you see people do. What can you see as you take your ride to your destination? Is your route clear? Present the experience to your class in a poster map, a digital slide show and a staged seating of the ride. Rearrange chairs to mimic the experience. How do people purchase tickets to ride mass transit in your city? What do the tickets look like? Are they printed on paper? Are they a plastic credit or debit card? What information is on the front? What information is on the back? What does the ticket tell you about your city? What other information could it provide? Can you think of an encouraging message about riding public transit, walking and biking rather than driving cars? Research the energy required for a typical car, a bus and a bike on a route from home into downtown or place of work. How do they compare? Design the front or back of a mass transit ticket that would give this information visual appeal for your city. Activity 4 – mass transit as moving billboards! Everyday thousands of buses, boats and trains move into, through and out of a city. They are moving billboards that can communicate the spirit of a city, announce special events, and expand cultural community. Think about your city, its distinctive characteristics, its special festivities and activities. Think of a graphic that could be painted on a bus, boat or train that could carry your message around the city. Check with the transit authorities to see what companies handle transit advertising. Find out what advertising rates are charged for a poster or a whole bus. Propose an advertisement. Take a picture of a bus or train car and trace your advertisement over it. Present it to your class. Send your class presentations into the advertising company! See if they will choose one to complete. Mass transit stations create mixed use cultural and commercial nodes. Cities increase opportunities for people to live, learn, work and play close to transit stations. Check out this Transit Calculator and see how transit stations can build equity for a city through new jobs, higher land values, and increased community connectivity. More activity means more home revenue, construction jobs for homes and stores, more purchases, and increased tax revenue to support retail, city services and infrastructure. Transportation has always been a driver for city development. Now public transportation becomes a driver for Transit Oriented Neighborhoods. TODs are healthy and desirable places to live because people can use the bus, tram, or train system to get to and from work instead of spending hours in traffic driving. Map your TOD’s in your city and suggest new ones! Be a Transit Oriented Development advocate! _________ are unclean environmental conditions or substances from the use of vehicles. Mass transit transportation systems move many more __________ from one place to another.